This Saturday marks the 20th anniversary of Nirvana front man Kurt Cobain's death. Cobain was 27 when he took his own life on 5 April 1994 in the garage of his home in Seattle, Washington. Despite the strong association of the grunge icon with Seattle, Cobain only lived in that city for 18 months. The place where he spent most of his life is Aberdeen, a small logging town about 100 miles (160km) south-west of Seattle where he was born in 1967. Although Cobain lived there for 20 years, locals in Aberdeen still feel conflicted about the legacy of their city's most famous son. The town - which has never recovered from the decline of the timber industry and has an unemployment rate nearly twice as high as in other parts of Washington - is still ill at ease with Cobain's history of depression, drug abuse and suicide. It doesn't help that in several instances Cobain described Aberdeen as a place "full of bigoted rednecks". Cobain also often spoke about his unhappy upbringing there, particularly after his parents divorced when he was eight years old. Despite his difficult relationship with his hometown, many of the songs that Cobain wrote were informed by the imagery of the city, where Nirvana's bassist Krist Novoselic also lived as a teenager and where the band's first rehearsals took place in the mid-1980s. The first recognition for Cobain in Aberdeen came in 2005 when the Kurt Cobain Memorial Foundation erected a sign at the eastern entrance of town that still causes controversy. It reads: "Welcome to Aberdeen, Come As You Are," a reference to one of Nirvana's hit singles. In 2011 a proposal to rename after the singer a bridge over the Wishkah River - famous for a mention in the song Something In The Way, and where Cobain reportedly slept on several occasions - was shelved. Some city councillors argued that renaming the bridge would glorify Cobain's drug use and suicide. The council did approve renaming a small strip of land near the path to the underside of the bridge as the Cobain Landing. For years grunge pilgrims from all over the world have paid their respects to Cobain in that place, where an electric guitar statue and several memorial plaques stand. Last February 20th, coinciding with what would have been Kurt Cobain's 47th birthday, Aberdeen Mayor Bill Simpson declared an official "Kurt Cobain Day". The festivities included the unveiling in the town's museum of a less-than-flattering statue of a crying Cobain made by a local artist. According to the local press, the event was received by Nirvana fans with a mixture of shock and confusion. "This year's celebration happened so quickly. We didn't have much time to prepare it. Next year we are planning to have a bigger birthday party with a bunch of local bands playing," Mayor Simpson told the BBC. Questioned about why it has been so difficult for the town to honour its most famous son, Mr Simpson pointed to the singer's history of drug use. "The thing that stood out at the time when he died was that he was a druggie and he killed himself. That was what everybody in town said," Simpson said. "Still today some people think that honouring him we are encouraging kids to use drugs," he added. "But I don't think it is true. We have to look at his music." Among those who think that Aberdeen could be doing a better job at honouring Cobain's legacy is his biographer Charles Cross. "The main problem is that Kurt said negative things about Aberdeen," says Cross, who has just published Here We Are Now, a book in which he analyses the lasting impact of Cobain. "They should be doing far more. First because it is the right thing to do and second because there is an economic reason," he said. "If they did something around Kurt they would get a significant entry in tourist revenues," he added. "But as the cement statue recently unveiled shows, the city just doesn't know how to get it right." The day I visited the Cobain Landing in Aberdeen there was a middle-aged couple from Portland, Oregon, taking pictures. "No matter what you think of his lifestyle, it doesn't make sense to deny that he had a huge impact in music," they told me, pointing out that they had the opportunity of seeing Nirvana play in several occasions before the band became famous. "I don't think Aberdeen is doing a good job honouring him," they said. "If you didn't know about Cobain's connection to the city you wouldn't know. The Come As You Are sign is nice and this park is beautiful, but I don't think [it] is enough." In 1985, in one of the several occasions Cobain became homeless after arguing with his mother, he ended up moving for about a year into the house of LaMont and Barbara Shillinger, the parents of two of Cobain's school friends. 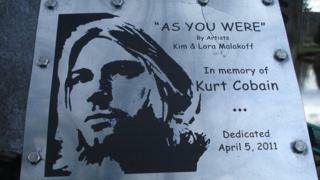 LaMont Shillinger believes the town is getting better at recognising Cobain's legacy. "Having a Kurt Cobain celebration is a good thing although it wasn't exactly a wonderful event," he said. "A lot of those people that don't want to honour him have come to realise the talent he had. "It is kind of contradictory that they say they don't agree with drug use because Aberdeen has one of the highest rates of alcoholism in the state. And I don't think heroin is any worse than alcohol." A few years ago Cobain's mother Wendy O'Connor moved to California, although she kept the house where the family lived when Cobain was a child. Despite being assessed at a value of about $65,000 (£40,000), a few months ago O'Connor listed the property with an asking price of $500,000. Now, a young journalist from Portland is trying to raise $700,000 to buy the house and convert it into a Cobain museum. To know what Cobain's family thinks about how Aberdeen is dealing with the singer's legacy, I travel to the Country Estates mobile home park, located a few miles east of Aberdeen. Cobain lived there for a while with his grandfather Leland Cobain. Now the house is occupied by Gary Cobain, Leland's son and Kurt's uncle. "I think in Aberdeen are doing a good job ignoring Kurt," he tells me. "He had a drug problem and they don't like that, but if they did more to honour him it would bring money around here. The thing is that they have nothing to lose because the place is going downhill anyway", he says.